Houseboat 100ft £60,000 Spent On Hull! P/X Considered! Recent Survey. Built in 1961 and originally used on the River Lea to transport horses the vessel has been updated to what appears a very high standard by the owners over the last 4 years. She is currently in Dry Dock having a complete new steel bottom & sides. Inside, there is a large living area and kitchen as well as four separate cabins/bedrooms and two bathrooms. With views of the river Medway near to Rochester, Kent, this is a fantastic opportunity for someone who wants a ready made family home on the water. Register with Boatshed to see 84 extra photos of this Houseboat 100ft £60,000 Spent On Hull! P/X Considered! Recent Survey. Boatshed Medway are delighted to offer this converted barge for sale on a residential mooring close to the historic town of Rochester. The owner would consider a part exchange with a much smaller vessel - up to £30,000 true value and in good condition - preferably with a recent survey. The barge has a prime spot and she would be able to stay on her current residential mooring at the Marina subject to marina owners meeting. 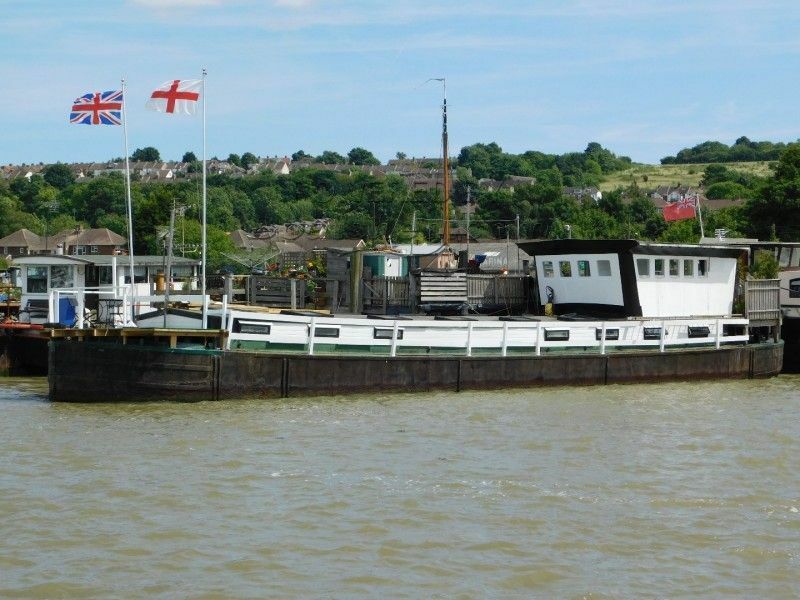 She is on a lovely spot with great views of the River Medway and benefits from a decked area next to the vessel, she is located in with a very good small community of barges that are well established. Located only 1.5 miles walk from Rochester train Station which can now get you into St Pancreas in just 35 minutes. This vessel has recently been in Dry dock having a complete new steel bottom & sides at the cost of over 60k! Which should give any prospective buyer piece of mind for many years to come. She looks great and the works carried out will satisfy any insurer. She has a current survey to prove this. This is a 4 bedroom home on the water for the price of a one bedroom flat in the same area. The rooms are of good proportions and the light floods in too. The living room is a very good size and has a really funky feel. There is a gorgeous wood burner too that provides a traditional and cosy feel. This barge benefits from a front and rear deck area to lounge around on as well as a good decked area for storage when you walk through the gate to access the boat. There is plenty of parking available, a cafe and a lively bar. The mooring would be available subject to the marinas approval. If you feel that life on the water is for you then this barge offers excellent accommodation, location and facilities. What detached house with a river view could you buy for this price? Please contact us for details. This Houseboat 100ft £60,000 Spent On Hull! P/X Considered! Recent Survey. has been personally photographed and viewed by Jamie Nash of Boatshed Medway. Click here for contact details. Hi Sandra at the moment the marina have told me that you would pay either £646/month or with discount on an annual £6198. This would have to be confirmed with marina at point of an offer made. But it is hot off the press!